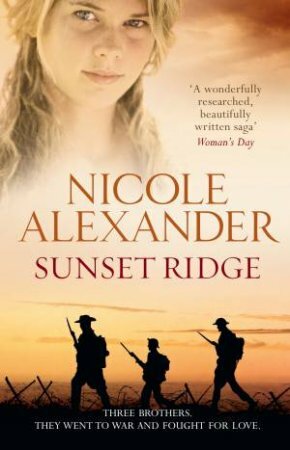 Nicole Alexander's new bestseller is an epic historical novel that takes three brothers from the drought-stricken outback of Queensland to the horror of the trenches in World War One. Although Madeleine has grown up in the shadow of her grandfather, the renowned artist David Harrow, she knows little about him. For David died long before she was born, and his paintings sold off to save the family property, Sunset Ridge. It's 1916, and as Europe descends further into bloodshed, three Queensland brothers -Thaddeus, Luther and David Harrow - choose freedom over their restricted lives at Sunset Ridge. A ‘freedom' that sees them bound for the hell of the trenches.